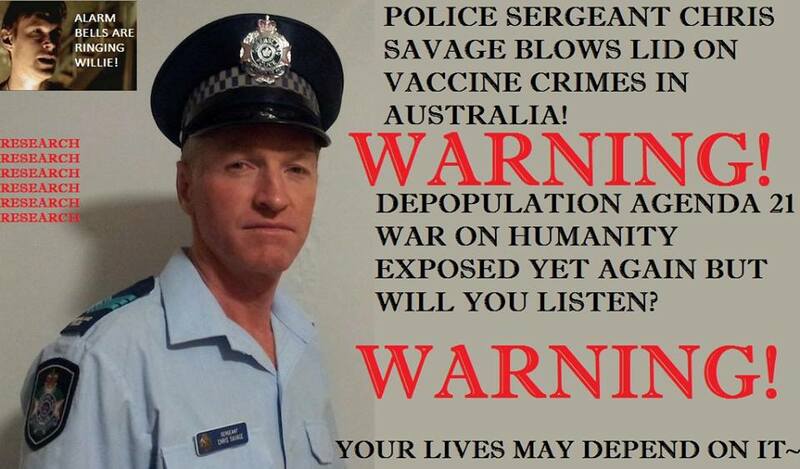 POLICE SERGEANT CHRIS SAVAGE BLOWS LID ON VACCINE CRIMES IN AUSTRALIA!! I attended several where the baby was found dead by one of the parents in the morning, in Australia the term “Sudden Infant Death Syndrome” is used to describe this outcome. Notice how the “syndrome” is frequently used – I believe this serves the purpose of mystifying the problem and therefore the cause. Another is “gulf war syndrome” which is clearly caused by the Anthrax vaccine. She went to several doctors trying to find an answer. They gave her a common drug called “Panadol” which did not do anything. The convulsions continued so she went to another doctor who gave her another drug which also did not work. The baby continued to convulse and vomit frequently. The little girl would not sleep and the mother was sleep deprived also. Another incident occurred when I saw a father come through the Ipswitch District Watchhouse Q1D on the charges of Manslaughter (similar to 2nd degree murder) of a 5 year old that had suffered a severe reaction to the initial vaccines and was brain damaged. The QPS relied on the false medical premise titled “shaken baby syndrome” – there is that “Syndrome” word again. The child succumbed to the injuries from the vaccines and the QPS opted to blame the father on the basis of “Shaken Baby Syndrome” but there was no evidence other than the vaccine for the cause of the injuries when the “shaken baby” accusation was applied. When the detectives investigate the death of a baby they interview each parent separately. If there are any conflicting versions of the story they use the differences to attack the parent’s credibility and rely on the flawed “shaken baby syndrome” medical evidence. If there is no conflict, even a minor one in the parent testimony, the police then turn it over to a “medical doctor” who has “experience” with “shaken baby syndrome” and attempt to prosecute from that angle. If the parents tell the investigator they picked up the lifeless baby and shook it to wake it, the police will prosecute even though the baby was already dead. Since “shaken baby syndrome” has no hard evidence, such as bruising or other injury, it’s the perfect way to blame parents for damage caused by vaccines. In October of 2009, a baby died shortly after being vaccinated with the H1N1 vaccine, and to everyone’s surprise the state coroner ruled that there was no link to the vaccine. In my view, the QPS officers are sufficiently brainwashed to not realize the vaccines are causing the injuries and deaths; and when they investigate and prosecute they rely heavily on “medical evidence” which is significantly influenced by big Pharma, and appear to wish to divest responsibility. After giving a parent an article by Dr. Vera Schreibner, which outlined vaccine damage, the hierarchy of the QPS pursued me so I left on medical grounds. Upon my exit they tried to get me to take SSRI’s [Selective serotonin re-uptake inhibitors] but I threw them all in the trash; they would have caused severe problems as you already know. These Babylonian devil worshippers are going down and their war on Humanity is coming to an end. People need to understand who our real enemy is and that is happening at an exponential rate. There's a method to their madness.. there's really not much method to yours.. because you're operating from a place of ignorance. Until you change that, you're going to be bumbling around, BUMPING INTO EACH OTHER, saying and doing the wrong things, not understanding the nature of your enemy. If you don't understand the nature of your enemy and the weapons they use, YOU CAN NOT FIGHT THAT ENEMY, YOU CAN'T FIGHT THE BATTLE, YOU SHOULDN'T EVEN BE ON THE BATTLE FIELD. It's why you are losing the war. And don't tell me you're not, because I am in a place of great knowledge about who's winning and who's losing this war, and I can assure you YOU'RE LOSING THE WAR. It doesn't mean it can't be turn around, but it will never be turned around until you learn what you need to know..
You don't even recognize half the weapons they use against you. Some of them seem so insignificant that you don't even try. AT the No Jab No Pay No Way rally in Brisbane Qld Australia former Sergeant of Police Chris Savage explains how police and doctors who are brainwashed blame parents for vaccine injury and death. Former Sergeant of Police Chris Savage was working in the Queensland Police Service from 1990 to 2012 and he was harmed in October 1989 by the Hep B vaccine. This woke him up to the danger of vaccines and then during the career he attended sudden deaths of babies after vaccines. He asked the parents what the baby's health was like in the 2 months with no vaccine and the light came on and they said their baby was healthy eating and sleeping and after the vaccine all hell broke loose with inconsolable crying, convulsions, seizures and then death. Brainwashed police are accusing the parents of Shaken Baby Syndrome. Parents who found there baby deceased and picked the child to gently shake were immediately accused of SBS. Then the police would rely on pro vaccine doctor's medical evidence to convict the parent or baby sitter and they would go to prison. On all the post mortems the SIDS, SUDI or SBS all had Cerebral Cortex inflammation and swelling which causes brain to push against the skull and artery compression would lead to bursting and the baby would be severely injured or die. How Vaccines Harm Child Brain Development - Professor of Biology Dr Russell Blaylock - Warning to all! !